The Houlton Council of Catholic Women met on Monday, Feb. 4, in the Parish Center. There were nine members present for the monthly meeting. HOULTON, Maine — The Houlton Council of Catholic Women met on Monday, Feb. 4, in the Parish Center. There were nine members present for the monthly meeting. Vice President Janet Barker, who were ill. The group recited the Prayer to Our Lady of Good Counsel, Salute to the Cross, Pledge to the Flag, and Prayer for Direction, then sang our hymn, O Beautiful Mother. A blessing was offered prior to a luncheon provided by the February committee and fellowship was enjoyed by all. Kathy Klein, recording secretary, read the minutes from the January meeting. Treasurer Jane Mitchell gave the financial report. Jane Stile read correspondence in the absence of Corresponding Secretary Alta Reardon. Mary Grant read a note from Milford Clark of Tennessee. Milford is the brother of three HCCW members; Mary Grant, Jane Stile and Bunny Tidd. He gave a generous donation to the organization to benefit the Valentine Project. Stile shared an article from the Houlton Pioneer Times from 1981, when members entertained residents at Madigan Nursing Home. Another article dated, February 2000, told about the Valentine Gift Project that was organized in 1990 and is still a special ministry today. Originally, the Council decorated boxes or baskets and filled them with special treats for shut-ins. Today, they use gift bags filled with items such as sweet treats, candies, cookies, and include prayer cards, and precious homemade Valentines created by the children in Faith Formation. In addition recipients are given separate bags with a selection of healthy fruit. 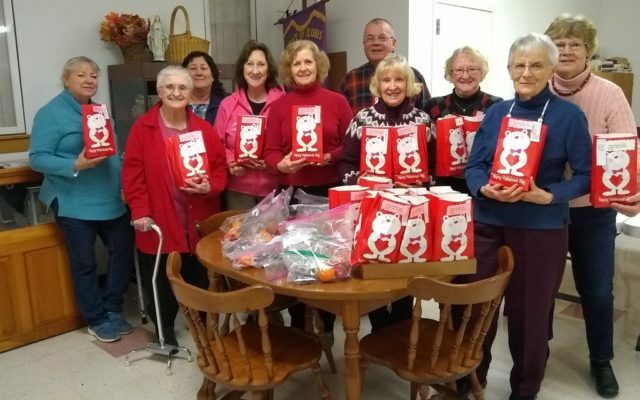 Mary Grant, Judy Fitzpatrick, Rose Levesque, Ethel Mersereau, and Stile will deliver over 40 filled Valentine gift bags to shut-ins in the Greater Houlton Area. HCCW will once again organize the Cake Walk at the St. Patrick’s Bazaar next month, and will donate a girl’s bicycle for the raffle. Community Living Association, Special Olympians will receive a generous donation from HCCW. Masses will be offered by the Council to honor residents and staff at both Gardner Health Care Facility and Madigan Nursing Home. A mass in memory of long time HCCW member Rose Bushey was held Sunday, Feb. 10 at 8 a.m. Grant and Stile will bring the gifts to the altar. Members were asked to give some thought regarding the annual year-end banquet, and provide suggestions. Birthdays and Anniversaries were recognized. Julie Codrey won the door prize. Prayer intentions were received. The meeting closed as members recited five Hail Mary’s. The next meeting will be on Monday, March 4, at 5:30 p.m. in the Parish Center. All Catholic Ladies are encouraged to attend.